Heaney, Richard, Pert Inn, Perth. McClure, James, Royal Oak, Wellington and Elizabeth-street. James Whitehead, Waggon and Horses, ditto. Thomas Gibson, Eagle, Epping Forest. Major Welman, Captain Neilley, F. Evans, Esq., W. H. King, Esq., J. Atkinson, Esq,, J. Cameron, Esq., Captain Stewart, R. Wales, Esq., J.A. Wheeler, Esq., J. Sinclair,. Esq., J. Robertson, Esq., W. G. Sams, Esq., J. B. Thomas, Esq., J. R. Bateman, Esq., Captain Friend, Wm. Gunn, Esq., (chairman), A. Thomson, Esq. The police magistrate remarked that during the past year the licensed houses had all been conducted remarkably well. J. Barrett, Black Horse, corner of Wellington and Elizabeth-streets.–Granted. Wm. Bryant, Market House Tavern, St. John-street.–Granted. Wm. Bull, Tam O’ Shanter, Canning-street.–Granted. George Burgess, Tasmanian Inn, Patterson-street.–Granted. William Carpenter, Elephant and Castle, corner of Frederick and Wellington streets.–Granted. It. Chugg, Sir William Wallace, Franklin Village.–Granted. William Cook, Bricklayer’s Arms, corner of York and George streets.–refused, on the ground of being badly conducted. William Dent, Carpenter’s Arms, Charles-street.–Granted. John Dowling, Jolly Butchers, corner of Charles and York streets.–Granted. William Duncan, sen., Bull’s Head, Charles street.–Granted. William Duncan, jun., Jolly Anglers, Bathurst street.–Granted. John Dyer, Traveller’s Rest, Muddy Plains.–Granted. James East, Scottish Chiefs, Wellington-street.–Granted. Thomas Fall, Clarendon Hotel, Evandale.–Granted. S. Feutrill, Wheelwright’s Arms, Brisbane-street.–Granted. Thomas Fuller, George Inn, Wellington and Elizabeth streets.–Granted. H. Godfrey, Horse and Jockey, York-street.–Granted. J. Green, Hibernia, corner of Brisbane and Bathurst streets.–Granted. W. Guest, East Bank Inn, George Town road.–Granted. W. Hedger, White Horse, Patterson-street.–Granted. Thomas Hill, Enfield Hotel, Brisbane-street.–Granted. Ellen Hinshaw, Prince of Wales, corner of Wellington and York streets.–Granted. James Johnson, St. John’s Tavern, Elizabeth-street.–Granted. John King, Prince of Wales, Evandale.–Granted. Elizabeth Kitson, Launceston Hotel, Brisbane-street.–Granted. Stephen Knapper, Steam Packet Tavern, Wharf.–Granted. 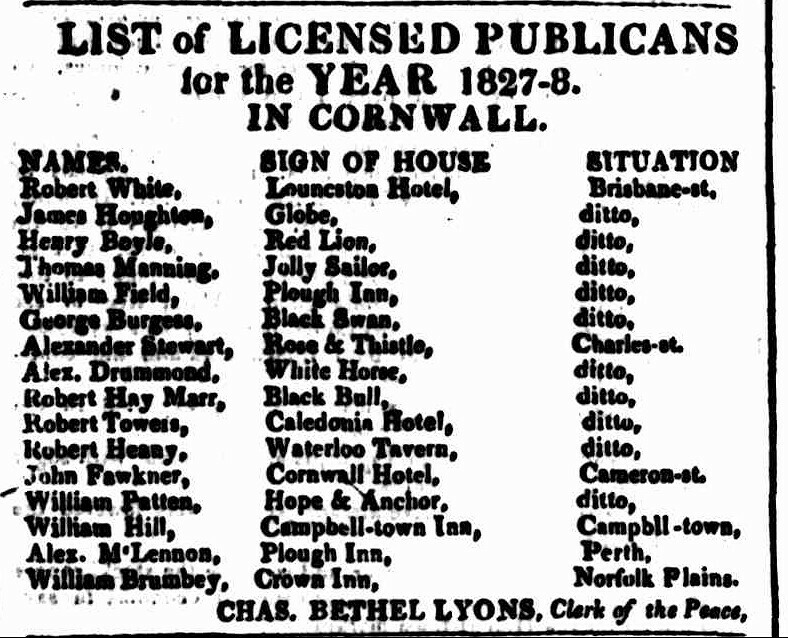 Thomas Lawson, Plough Inn, Charles-street.–Granted. James M’Kensie, Mason’s Arms, Wellington-street.–Granted. M. Monaghan, Caledonian Wine Vaults, corner of York and Charles-streets.–Granted. P. Monaghan, Britannia Wine Vaults, Wellington-street.–Granted. J. Moore, Rose and Crown, Franklin Village.–Granted. John Morrison, Royal Oak, Evandale.–Granted. Thomas Neville, White Hart Inn, Wellington-street.–Granted. Ann O’Halloran, Crown Inn, corner of Bathurst and Elizabeth-streets.–Granted. W., G. Pilbeam, Albion Inn, Cocked Hat.–Granted. J. Pischer, Rising Sun, Muddy Plains.–Granted. N. Poole, Hadspen Inn, Hadspen.–Granted. Mary Radford, Golden Lion, William-street, Granted. W. H. Rosevear, West Tamar.–Granted. R. Scott, Glasgow Wine Vaults, George-street.–Granted. John Selby, Cart and Plough Inn, Wellington.–. street.–Granted. W. Smart, Lamb and Flag, York and Bathurst-streets.–Granted. William Spearman, Union Inn, George-street.–Granted. Henry Sullivan, Robert Burns, Charles-street.–Granted. John Sullivan, Wilmot Arms, Wellington and Brisbane-streets.–Granted. M. Sweeney, Star Inn, Charles-street.–Granted. J. Waldron, Albion Hotel, George and York streets.–Granted. B. Walford, London Tavern, John and Cameron, streets.–Granted. Ann Walsh, Prince Albert Inn, Charles and Elizabeth streets.–Granted. S. Warnes, Commercial Hotel, George and Cimitiere streets.–Granted. R. Waycott, Sir George Arthur Inn, Sandhill, granted. Donald Westcombe, Ferry Houses, Tamar-street, granted. John Williams, Sailor’s Return, River Forth, granted. John Williatt, Patriot King, Evandale, granted. Augustus Wood, George Town, granted. E. Bartlett, Port Sorell Inn, Port Sorell, granted. R. Blake, York Hotel, York-street, granted. Thomas Brookery, Coach and Horses, Charles and Paterson-streets, granted. W. Clarke, Exchange Wine Vaults, corner of Charles and Patterson-streets, granted. Isaac Coote, Angel Inn, Charles-street, granted. Louisa Gee, Australian and Tasmanian Hotel, Wellington-street, granted. E. Humphreys, Wharf House, Wharf, granted. James M. Martin, Edinburgh Castle, corner of Frederick and Bathurst-streets, granted. Henry Mills, Cross Keys, York-street, granted. George Summers, Bird-in-hand, Elizabeth-street, granted. John Williams, Duke of York, Wellington-street, granted. James Wilson, British Hotel, George Town, granted. Thomas Jones, Port Sorell Inn, George Town, granted. Robert Edwards, Tamar Hotel, East Tamar, granted. There were four applications for new licenses: Charles Coward, for a house at Mount Direction, H. B. 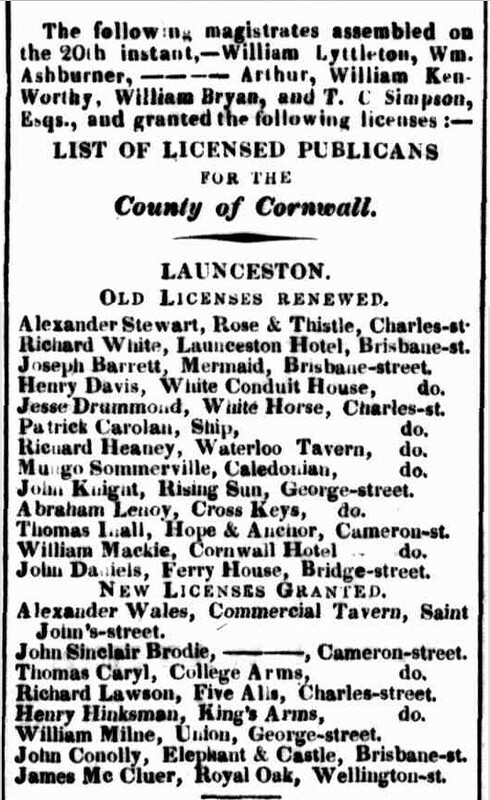 Little, for one at Hadspen, and Joseph Thorn and James Lilly, for houses in Launceston; but as, in consequence, of the lieutenant-governor having limited the number to be issued in this district to sixty-one, there was only one vacancy–caused by the refusal of Cook’s license, the meeting was adjourned until the 17th instant, for the further hearing of the applications. A great want of order was manifested at the meeting on Monday: on some occasions the confusion and uproar was so great as to prevent the possibility of hearing the names called over by the clerk of the peace. A. Drummond, White horse, do. W. Patten, Hope & anchor, Cameron st.
R. White, Launceston hotel, Brisbane st.
G. Somerville, Caledonian, Charles st.
J. Anderson, Cross keys, George st.
J. Knight, Rising sun do. 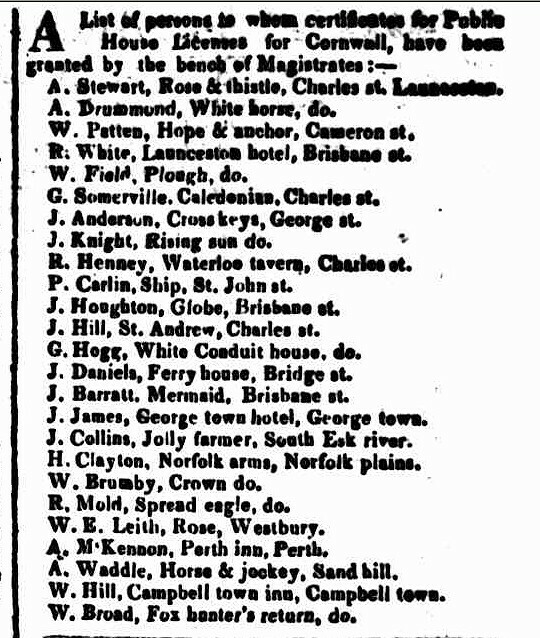 R. Henney, Waterloo tavern, Charles st.
P. Carlin, Ship, St. John st.
J. Houghton, Globe, Brisbane st.
J. Hill, St. Andrew, Charles st.
G.Hogg, White Conduit house, do. J. Daniels, Ferry house, Bridge st.
J. Barratt. Mermaid, Brisbane st.
J. James; George town hotel, George town. J. Collins, Jolly farmer, South Esk river. H. Clayton, Norfolk arms, Norfolk plains. R. Mold, Spread eagle, do. W. E. Leith, Rose, Westbury. A. M’Kennon, Perth inn, Perth. A. Waddle, Horse & jockey, Sand hill. W. Hill, Campbell town inn, Campbell town. OUT OF LAUNCESTON, BUT IN THE DISTRICT. William Smith, Rose, Landfall, R. Tamar. Joseph James, George-town Inn, George-town. Thomas W. Massey, —— , Benlomond. The annual meeting of Justices for the purpose of hearing applications for public house and packet licenses for the Launceston district was held in the Court House on Saturday, the following Magistrates being present—J. Whitefoord, Esq. (Chairman), His Worship the Mayor, the Police Magistrate, Major Welman, Captain Reid, Lieut. Westenhall, James Robertson, James Aikenhead, Archibald Thomson, William Barnes, E. Whiting, John Fawns, J. G. Jennings, W. G. Sams, and John Thompson, Esquires. Launceston has long been favorably known for the good character of its hotels, and we believe it was or is in advance of the southern capital. Placed as this town is with regard to the other colonies, it is important that it should always be able to offer to travellers and strangers the comforts and conveniences which every Englishman expects to find in his hotel. We have therefore great pleasure in noticing the improvements which have within a recent period been effected by the enterprise of the proprietors of the leading hotels in Launceston. First in order of time as well as in reputation we have the Launceston Hotel, where, on the site of one of our Tasmanian antiquities the old “Launceston” a commodious and elegant building was erected between two and three years ago by the present proprietor, Mr. William Carpenter. This building was at once a credit to the proprietor, the architect, and the town. The front in Brisbane street was the first innovation here on tile prevailing style of hotel architecture, and in the internal arrangement of the building convenience and comfort were specially provided for. The centre of the ground floor consists of a public room, 21 feet by 1f feet; the left wing includes a suite of elegantly furnished rooms, securing privacy and convenience; the bar being in the right wing ‘of the building. The upper floor consists of bed-rooms and parlors most conveniently arranged for the accommodation of families and others visitors; and having in front an airy balcony. The billiard-room adjoins the building at the back, and the stables are entered from St John-street. The reputation of this establishment for respectability has been well sustained, and its commanding position and influential country support give it a prominent place amongst the hotels of the colony. 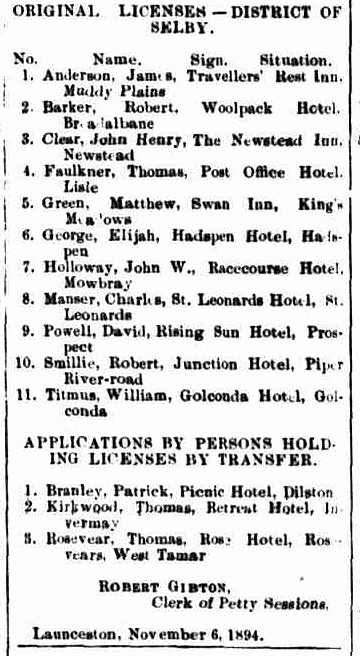 APPLICATIONS FOR RENEWAL OF LICENSES, LAUNCESTON. Thomas Woods, Shamrock Hotel, Elizabeth-street. Thos. Wootton, Bush Inn, West Tamar. APPLICATION FROM PERSON HOLDING LICENSES BY TRANSFER. Thomas Wadham, Plough Inn, Charles and Patterson streets. Randall Risley, Swan Inn, King’s Meadows. NEW APPLICANTS FOR OLD LICENSED HOUSES. Henry King, Sportsman’s Hall, Charles and Balfour streets. Walter Harris, St. Leonards Hotel, St. Leonards. APPLICATIONS FOR A LICENSE FOR A NEW HOUSE. William Edwards, Vine Grove House, Scotsdale. George Talmage, steamer Pioneer, trading between Launceston and the North-West Coast. Charles Edwards, East Tamar Hotel, East Tamar, was the only applicant refused a license. When the application of Mrs Green for a renewal of the license to the Hibernian Inn was called on, Mr Turnbull asked whether the house was required in the locality. Mr Coulter said it was a necessity, as there was no other public house near it, and it was one of the cleanest and best-conducted houses in town. The Mayor said Mrs Green was a most industrious, respectable woman who conducted the house admirably. He had visited and inspected the house, and found it a model of cleanliness. The Chairman added–And that we may assume to be the nearest approach to godliness that can be expected of a publican.